There have been some interesting theories around the “bomber” the liberals call the MAGA bomber. A few people have reached out to me with some questions/theories and I have read several threads that have a lot of interesting details. Below I have included some of the questions that need to be answered and a thread by a great Q researcher. Hopefully, we get to the bottom of this and the truth comes to light. Here are the targets of potential explosive devices. Here are the areas Democrats are threatened in the midterms. Have you noticed the lack of any family, friends, neighbors, current/former co-workers etc. being interviewed by the MSM, or for that matter any other media outlet? How did one man, who supposedly lived in his van, have the resources to send these "bombs"? Then to get them to arrive in the selected locations within the correct time with no postal markings? I find it hard to believe that the stickers all over the van windows did not make the liberal biased news. A man wears a MAGA hat and makes headline news. Great thread by @findtruthq below. I have included a few tweets in between that are interesting as well. I don’t even know where to begin on this BS. Let’s get one thing straight before we jump into this obvious false flag. None of the packages contained a single explosive device. Not one!! How can you be a mail bomber if not one was actually a bomb? So the #MockingbirdMedia has all coordinated the headlines ..bomber bomber bomber …yep. These so-called bombs had no activator, no trigger and weren’t even compiled of any substance that could be explosive. Can someone tell me why in the hell anyone would play with a package that appeared to be a bomb when opening it?? Anything the bomb squad deems to be POTENTIALLY explosive they blow up themselves and they do it extremely carefully. The device has wires sticking out of both ends which, I’ve read, is a clear indication that they are non-functioning. So if they are incapable of exploding then they are NOT bombs or pipe bombs or any other explosive device! Why is it that none of the packages had any post markings on the stamps?? How did they all arrive within minutes of each other all across the country if they never actually made it through the mail?? Info from a retired postal worker. Also please keep in mind the media has to lead us all to believe that these packages actually arrived at Obama, Clinton’s, etc residences. NO, THEY DIDN’T! This is what the media does? They brainwash into believing what they want us to believe. His profile showed he was a Democratic voter and shortly after everyone started posting that his profile was changed to Republican!! False- flag gone wrong, when you don’t cross your T’s and dot your I’s! It just so happens the return address on all the packages tie back to the Sunrise Police Department. Yes, there are multiple businesses at this address, but something to consider nonetheless. This guy has been a criminal his entire life. Seems like a VERY EASY suspect to pin this one on right? 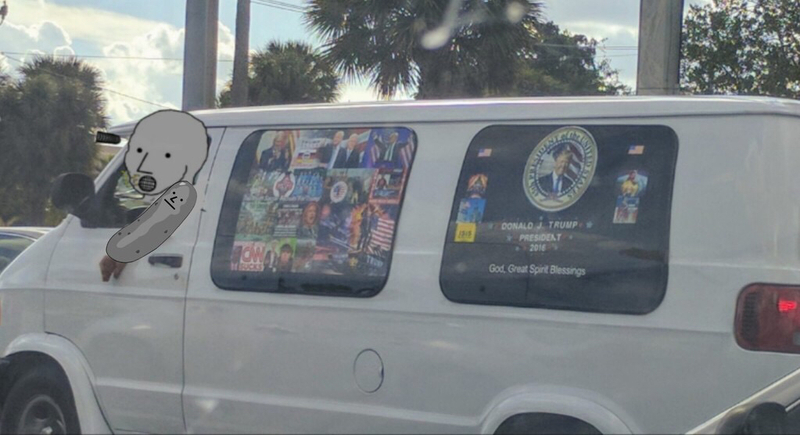 Here is the van they allegedly found just so happened to have Trump loving and Hillary hating bumper stickers all over the van. Can someone tell me why the FBI covered the van with a tarp? Why are they messing with evidence in an ongoing investigation? Multiple pictures have emerged…Major discrepancy…different images on the back of these two vans. This is hard to make out but it appears to be Cesar wearing a necklace that resembles a Mason symbol..can someone confirm one way or the other? I’m not saying this proves anything, just an oddity. The stamps allegedly used were 2016 “Forever” stamps, not 2018. FBI Director, Christopher Wray, just said in a press conference that 13 IED’s were mailed across the country. The hell they were IED’s! There were NO EXPLOSIVES!!! We are told to trust Wray..but he’s lying to us! He has 2 twitter handles one is @hardrock2016 & he follows only a handful of people many are liberal accounts. His other twitter handle is @HardRockintlent follows more accounts & some are conservative, however, he follows a bunch of random accounts. Now things are really getting interesting. Check these screenshots out. Don’t forget the other night Fox News (just as bad as any of the other Fake News) posted a random image of a box with a Q on it when discussing the suspicious packages. Pinning it on us. Well isn’t this interesting. Yes, this is Cesar…WTF!! And would you look at this!! C_A you say?!??! #35 on his rap sheet has been deleted. Why??? the corrupt Scott Israel of Broward County is in charge of this investigation…the same Scott Israel that completely covered up the Parkland shooting …nothing to see here. God this is a joke. just a coincidence I’m sure! anyone care to explain this from mylife.com?? Nothing is making any sense. I understand someone could have just made this profile. Odd nonetheless. “Ricki” is a 25-year C_A veteran!!! and he worked at Parkland!!! Holy sh!t! Literally within minutes after that FB post was made public they suspend him. Ok, just when my mind couldn’t be any more blown. Check out these two tweets from trump! Exact same date 6 years apart!!!! I’m going to say mylife.com is BS and anyone can make edits to that pages. So slides #8 and #29 which I’ve screenshot from this site. I'm convinced anyone can make edits to it. Disregard those 2 slides as new info comes out we will update them. @mymaria777 pulled Cesar’s background record and it shows he was a republican voter. We should all do our due diligence and make sure not to report any fake news. Great work Maria! some interesting anagrams with #CesarSayoc’s name!!! Thanks to everyone who sent these to me. What the hell is going on??? This stinks worse than Parkland and Parkland stunk badly. This is a joke, right? This is how the FBI covers the alleged van involved with mailing “explosives” to 2 ex-presidents & many other prominent politicians? With a tarp flapping around as If a 5-year-old secured it. This isn’t real life, is it? Thread by @_ImperatorRex_ on the indictment that has just been made public and it also stinks. So this is a 16-year-old van and he’s owned it since 2013…And he’s changed the license plate 4 different times since he’s owned it??? @Mark923to25 great find here. These pictures are the dagger for me. FBI NOT using gloves when handling a piece of evidence like this? A police badge on the inside of the dashboard? One pic has wiper blades and the other doesn’t? and this …literally gets crazier by the minute. New developments! Thanks to everyone who uncovers this. just adding interesting stuff as it comes across. All of these images are important. I can’t wait for the truth to unfold. excellent story! keep up the good work. i'm forwarding the link. Absolutely amazing article, Lexy. The Anons are on top of this. No one will ever convince me that this wasn’t the work of the Democrats. They are loosing badly, none of their usual tricks and schemes have been working. So, this was their new plan. Just another epic fail by them. We are awake! The Libs leadership and media have cried wolf so much and have spewed Hate, Threats and etc.. for years, so much know one believes anything they say. Their IQ is showing when a group of us Arm Chair warriors can kill their False Flag with only simple Google and or Public records searches. They don't have the brains to run a country and keep it secure. BTW: Any one care to explain how a PRO-Trump Sticker covered White Van has avoided all the Liberals we have seen nationwide destroying, tagging and burning vehicles for just 1 trump sticker? Something I’ve found odd about all the plate changes. All plates were changed on his birthday. Don't threaten the elites, thats the message that comes across. Regular folks, meh who cares. Tear’em a new one Lexy! You got my vote! Priceless information and the GUTS to publish. Feds are behind all of this, using manchurian candidates, easy targets to detain, and on and on and on. You rock, Lexy thank yo! This was the most comprehensive story on the bomber and the implausibility of this guy being the bomber I have read so far. Great job on putting together such a researched article. Love it! Here we are just over a week later. The MSM has dropped this story like a Trump success story. It seems no one seriously bought into the bomber story after day 2. Once the Keyboard Sherlock's ripped the presented facts and photos apart using simple logic and Google searching. WARNING ! As the Liberal present False Flag after False Flag they are getting better and better at erasing and staging background info and scenes. Either way we'll just add this to the growing list of FAIL attempts to stage a Political solidification for the Socialists and their agenda.